One of the best parts about being a stylist is constantly discovering new designers I would have overlooked otherwise. Yumi Kim has been around for over a decade, but it was only recently that I noticed her line of moody floral dresses that are just perfect for fall. Plus she offers sizes in XXS, which is rare for a designer brand! I ended up ordering this dress recently, which I wore on a recent trip to New York City. I had long been looking for a sleeved maxi dress that also had a higher neckline (is it just me, or are plunging necklines everywhere this season? ), but its sheer sleeves and skirt bottom balanced the conservative look accordingly. I was surprised at how well this dress fit my short torso, though I did have to get the length hemmed by several inches. 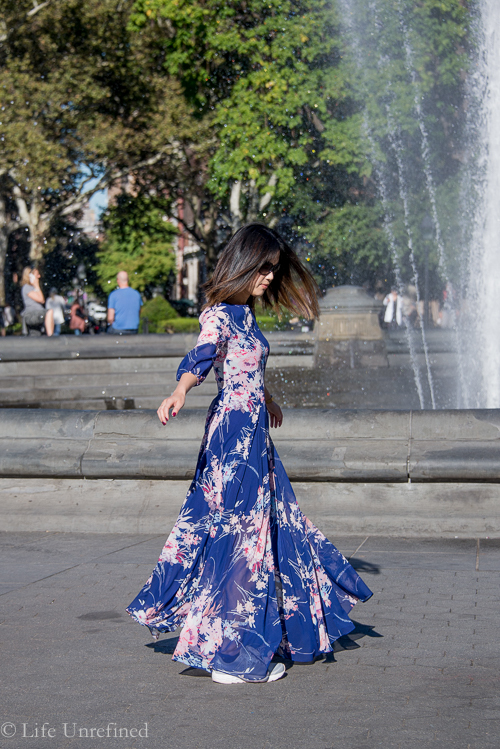 Just about every woman wears florals in the spring, but the darker colors of the dress make it a print that can be worn year-round. Wear it with heels for a special event or casually with a denim jacket. Currently, my go-to style pairing is with a black leather jacket. If you’re wanting to dine at a high-end, Michelin star restaurant but don’t want to pay the exorbitant prices, GK is a great spot for lunch. The $68, two-course lunch menu may still feel steep, but they don’t charge a supplement for the foie gras appetizer, which arrives in a generous portion. My friend’s squab entree was my personal favorite, though I did enjoy my pork dish as well. The Ambrosial dessert is worth the extra $19 if you want to end on a sweet note. A confusing name, but all you need to know is this – it’s been voted the world’s best bar. I’ll confess I don’t know much about cocktails despite the fact I took classes and technically have a bartending certificate (whatever that means, right? ), but the foodie friend I went with gave her approval for its claim. All I know is the drink I had was very, very good and I loved its chill environment. And seeing that people are willing to wait for a seat at its upstairs Parlor room, I’m not alone in saying it’s worth checking out, grabbing a drink and having a few oysters. The menu is a comic book, need I say more? Maybe I’m getting old, but I’m starting to prefer the vibe of Brooklyn over Manhattan. In fact, the crowd favorite on this trip was Lilia, an Italian restaurant that is located in what was formerly an auto-body shop. You would never have known it otherwise, with its wall-to-wall glass windows and modern interior. Their most recent menu listed grilled blowfish tails which was beautifully moist and flavorful. I also recommend the Bagna Cauda plate and pasta dishes. Pretty! The shape of the dress does seem perfect for fall. I’m with you on Brooklyn over Manhattan too!